For general advice on attacking the full court press, see "Attacking the Full Court Press". 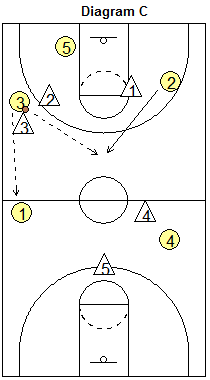 The 2-2-1 zone press attempts to deny the offense the sideline at the half court line. This press could be the opponent's primary press, or could be an "adjustment" after you have beaten their press up the sidelines a few times. Now they are trying to deny the sideline. So, like any other situation in basketball, you take what they give you... you will attack up the middle. 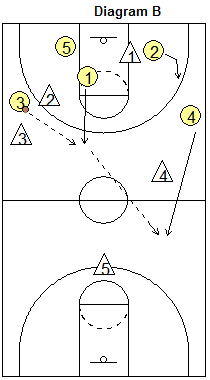 Here is one way to attack the 2-2-1 zone press. Refer to the Diagrams below. Use a 4-across set-up (Diagram A). O5 is the in-bounder. The two up front defenders will probably make it difficult for O1 or O2 to get the ball, but O2 should set a screen for O1. O5 fakes a pass to O1 or O2 but instead makes the quick pass up the side to O3 (who initially breaks long and then v-cuts back to the ball). As the defense attempts to trap O3 (Diagram B), O1 should be open for the quick pass up the middle. O1 can then pass to O4 going up the opposite sideline. O4 should get past the X4 defender. 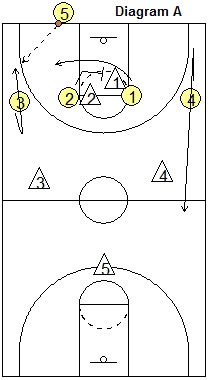 If the X4 defender goes man-to-man with O4, then O2 should be cutting up the left sideline for the pass from O1. Now refer to Diagram C. If covered, O1 should clear out and cut to the ball-side sideline just beyond the half court line. O2 should cut toward the middle to receive the pass from O3. Or O3 could pass to O1 up the ball-side sideline. Keep O5 back for a "safety" outlet pass for O3. If the ball reverses back to O5, then O2 must stay back and get the ball from O5. Also see the "60 Press Offense" for breaking this 2-2-1 press defense.